Our commitment to you doesn’t end when you hand us the check. All of our mechanic shop repairs are still honored under our lifetime warranty and our 100% satisfaction guarantee. With our mechanic shop in the same building as our auto body repair shop, we not only provide top-quality repair to any damage that your vehicle’s exterior or frame might have sustained, but we can also repair any damage to the engine, drive system, wheels, brakes, suspension, steering system, exhaust, cooling system, and even your air conditioning system. When Lakewood Auto Body was started, it was a small two-door garage that no one even knew existed. Now with our success we make sure that we don’t forget about the attitude and service that got us to where we are now. Customer service and the pursuit of perfection in every job we do, got us to where we are now, and we will never abandon our roots. When you bring your vehicle to us, you’re trusting our family with your personal vehicle. We take this as another challenge to step up to the plate and earn your trust as another life long customer. A challenge that we take seriously here at Lakewood Auto Body, and we won’t let you down. Lakewood Auto Body has been handling the auto body repair needs for the greater King and Pierce counties for over 50 years now. It doesn’t matter if your vehicle needs complete collision repair, or you are just looking for a car scratch repair, Lakewood Auto Body has got you covered. With our state of the art Shark electronic measuring systems, and our Bee Line frame racks, we definitely have the tools and equipment to ensure perfection in your auto body repair, but we also know that it takes more than just the best equipment to do the best job. In fact, to us, our 50 years of industry experience, and our commitment to a customer first style of doing business means more than all the high tech equipment and tools in the world. While we are proud of our top of the line facility that combines a professional grade auto body repair shop, auto paint shop, and fully equipped mechanical repair shop, we know that just the convenience alone isn’t enough to earn a customer for life. We believe that it is our honesty and commitment to customer satisfaction that will earn us the right to call ourselves number one in the industry. 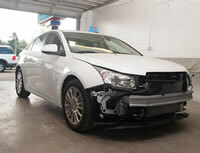 Many shops will take an auto body repair job or a major collision repair, and fill all the damage with bondo, sand it flat, and then spend some time painting it to cover up all the filler that they just used. The problem with this is that a few miles later after you’ve left there shop, you may run over a bump, or something might jar your car slightly, and the bondo will crack and suddenly your cut rate collision repair job just turned into a job your paying twice to fix. At Lakewood Auto Body, we handle everything from major collision repair, to a minor car scratch repair with the same careful attention to detail. Our personal pledge to you is that if any repair that we’ve done to your vehicle fails because we failed to do our job correctly, no matter how long ago we did the repair, we will make it right! 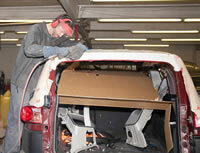 For the in auto body repair, collision repair, and car scratch repair, call Lakewood Auto Body today!